Ernst's Economy for you: Employees should have the right to be just very good in their job, without having to show further ambitions and they should get a better payment for it too. Employees should have the right to be just very good in their job, without having to show further ambitions and they should get a better payment for it too. My youngest son Roger is a 9-year old powerhouse at chess: he is extremely ambitious, a genuine fighter from the trenches of the game and always hungry for more training and more information about the noble game of chess. And perhaps most important: he somewhat lacks the power of self-relativization. His older brother Edmond, a very adorable person who is perhaps somewhat softer and more empathic than his little brother, also likes to play chess and in his own right he is very good at it. However, in comparison with his younger brother his own achievements pale. As this is amateur sports and not real life in which both would have to live from their hobby, this is not a very big problem. “As long as they have fun while doing it”, is in our family (and in many other families) the creed guiding us in the way that we look at the sportive achievements of our children. However, when it comes to common labour and especially the middle-class jobs for higher educated and trained personnel, it seems that this way of thinking is not viable anymore. Many companies in challenging fields of labour, like the financial and commercial services industry or the manufacturing industry and the government demand nothing less than absolutely first class achievements from their personnel: all day every day! And to make things worse for the modern-day workers, there is always Damocles’ sword, represented by at one hand the still enormous influx of cheap labour from Eastern and Southern Europe or India and on the other hand the ubiquitously mounting automation and robotization of their daily work and jobs. These circumstances combined put their job and in fact their sheer future on the line. If such workers are not good enough or cannot live with the pace of modern businesses, they are doomed to lose their job and sole source of income to either the cheaper workers from abroad or to the computers and robots of modern day life. This circumstance turns a normal daily job in a kind of top sports achievement with fierce competition, a lot of pressure and enormous challenges on a daily basis. And as professional sports require a “killer” mentality to become the best in the game at the expense of the competition, it goes without saying that for every “winner” there are countless losers who simply aren’t good enough to fix the job and win the medals. However, in normal jobs it is often much better when people cooperate intensively and when they trust and help each other fully in order to make the company as a whole benefit from the fruits of their labour. Where the topsports mentality leads to successes for a few persons, the rest feels victimized by it and loses confidence in their own abilities and in their mutual goals and dreams that drive the company as a whole. This could be devastating for the success of this company. And there is more. Where the winners of the company – the executive board and the upper management levels of the company – celebrate their own achievements with extremely high and ever rising remunerations in a so-called remuneration race with other CEO’s and leading managers all around the globe, the salaries and wages of the normal workers remain at a very stable level. As a matter of fact, in many cases their annual payment rises are close to nought [when adjusted for inflation – EL]. For older workers (i.e. well above fifty) there is nowadays even the looming danger of ‘demotion’, in which they get an easier job (i.e. less requiring), but against a lower annual payment. It is not really a pretty prospect when you have three children in high school or at the university, when a substantial part of your paycheck may vanish in thin air, due to a lower remuneration. The future for lower and middle class workers became more and more uncertain in general, as fixed jobs with lay off-protection became a luxury good, exclusively reserved for the higher echelons within the company. And former ‘lifetime’ jobs have been replaced for the uncertainty of an existence as either freelancer (i.e. ZZP’er in The Netherlands) or as a worker with only temporary contracts or zero hour contracts for a substantial number of years in a row. The latter is now especially true for younger workers below their mid thirties, but also older workers, who were so unfortunate to lose their fixed job, have to deal with this situation more and more often. And the labour unions – earlier strongholds of workers’ rights, fair remuneration and labour protection – are standing more and more offside in the labour negotiations as a consequence of the changing mentality among workers and employers. This is mainly caused by the union’s excessive focus on their ageing, 50+ member base and – on top of that – the changing labour contracts leaving less room for union membership. This led to a perfect catch 22-situation in which the youngsters didn’t feel represented by the unions anymore and as a consequence refused to become members of these labour unions. You could say that the labour unions managed to squander their worker’s confidence and goodwill, as many younger workers now think that they don’t need them anymore and the unions are useless for their own labour situation. These workers are probably wrong, but it is quite understandable why they think so. The waning popularity of the unions is exploited by the employers’ organizations, who seemingly take their chances to humiliate the unions during the (typical Dutch) general negotiations (i.e. ‘the polderoverleg’), in which the union’s and employers’ demands (including the government as large employer) for the coming years are negotiated. The labour unions reacted furiously. That there were a lot of hurt feelings from the past, became clear in the reaction of FNV [i.e. largest Dutch labour union- EL] chairman Han Busker: “Now they do it again. First they continue with shifting all risks to their workers and making uncertain labour the standard modus operandi. After that the attack started against lay off-protection. And now they kick the can down the road with respect to the mutually made agreements from the Social Agreement (i.e. the Dutch society-wide general agreement between employers, workers and the government) of 2015. This is pure unwillingnesss. This is aiming for prolonged uncertainty”. This news message is symptomatic for the waning influence of the labour unions and the abuse of this circumstance by the employer’s organizations, but also for the unhealthy focus of the labour unions on the older workers, as their almost exclusive grassroots. The younger workers feel not represented anymore by the labour unions, but by waving their union membership they make sure that they indeed are not represented by the labour unions anymore. This is a very unhealthy situation. Perhaps all these deteriorating circumstances form a good way to activate the top sports mentality and ‘killer approach’ among the workers, but in the end it will prove to be bad for the workers AND the companies themselves: I am actually quite certain about that. The labour market as ‘survival of the fittest’ seems to be the favorite dream of many ambitious companies and management consultancy firms. The ‘World of LinkedIn, McKinsey, Goldman Sachs, PWC and the Boston Consulting Group’ focuses solely on these “top sporters” and successful company sharks with skyhigh ambitions and no patience for less fortunate workers and in fact stimulates them in their “erratic” behaviour. According to me, this leads to ubiquitous distrust and envy among workers and it rewards a ‘dog eat dog’ behaviour between people, who should in fact all be fighting for the same just cause, but often fail to do so, as they consider it not to be in their own interests. Not everybody is fit to be a ‘top sporter’ in his labour achievements and nobody should be forced to behave like one, unless it is his ultimate desire to become one. Perhaps in the end those companies are most successful that give their workers the security they need and the chance to be themselves and to improve themselves in a slow evolutionary way that feels natural and safe for them. These are companies where doing the best you can is good enough, as long as you fit in the team and make the company as a whole better. No sports team can exist without the ‘water carriers’ who simply do their job well and require little attention and only the slightest compliment from their coaches. And no company can either... For instance rowing on the Thames with only captains, helmsmen and lone rangers in the team and no ordinary rowers and teamplayers is no guarantee for success. To the contrary… And football teams with only stars and primadonna’s bring seldomly the success that their coaches and fans aim at. I would advocate companies where good workers have the chance to excel in their jobs and just be good (or excellent) at it, without needing to have ambitions to reach higher and higher annually. When these workers want to grow, they should have all the chances, but if they don’t want to and they like their own job most, why should they always feel the obligation to grow?! Even though that might seem counterproductive and even a catalyst for stagnation and (worse) decline of the company, it might be the contrary: happy and motivated workers will probably produce more and better products than unmotivated and scared workers, who constantly worry about their personal growth and their chances of being fired at the spot. And there is more: please be so smart to pay workers for the increased productivity that they achieved in their hard hours of labour. 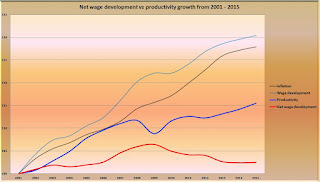 In a country as The Netherlands, the wage development is nowhere near the productivity rise during the last fifteen years, as the following table shows. In this table I compared the general productivity increase in The Netherlands with the wage increase during the last 15 years. When one does not take the inflation into consideration, he could think that the wages increased much more than the productivity in The Netherlands. However, when the inflation (i.e. 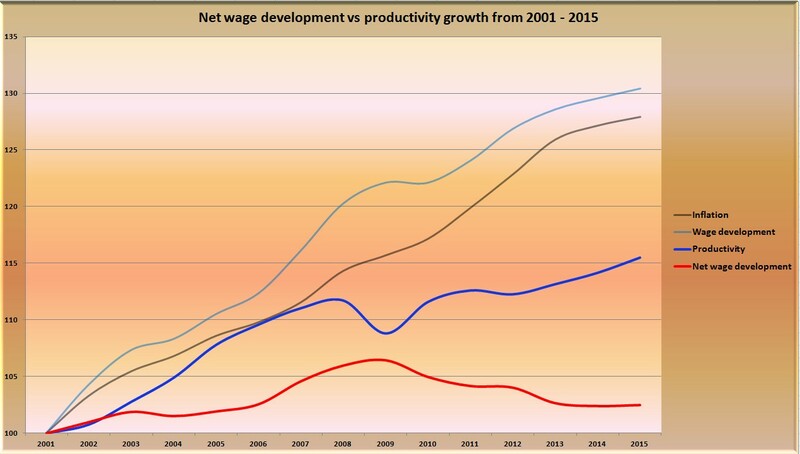 based upon the consumer price index) is taken into consideration, the total net wage increase between 2001 and 2015 was little more than 2.5%, against a productivity increase of 15.5%. This shows the substantial void between what employees produce and for what they are paid nowadays. Due to wage restraint and job flexibilization, the wages of lower and middle class workers have virtually stood still during the last fifteen years, while their productivity and thus the profits of their employers grew steady, by in average 1% per year. Therefore it is time to pay the workers their share of this productivity increase, instead of focusing on shareholder value alone or on new and more modern computer systems and even robots to totally replace these employees within a few years. This should be a reward for their loyalty and for their will to give the best of themselves on a daily basis. Motivated workers can still work wonders in a company, while computers and robots are very complex and therefore are often extremely hard to implement in an existing working situation. One could say that computers are in fact not always the best solution, in spite of the current state of technology.